Hygienic wipes proven safe for cleaning breast pumps, breast shields and accessories Ideal for quick clean up while traveling, at work or on the road One wipe cleans breast shields, valves and membranes Great for cleaning changing tables, high chairs, cribs, countertops, toys and more Part of the Quick Clean family of products and are perfect for out and about - a portable cleaning solution Unscented, alcohol and bleach free Great for changing tables, high chairs, cribs, countertops, toys and more, convenient, no need for soap and water Medela's Quick Clean products are designed specifically for cleaning breast pump and breastmilk feeding accessories, providing convenient cleaning options for every situation. 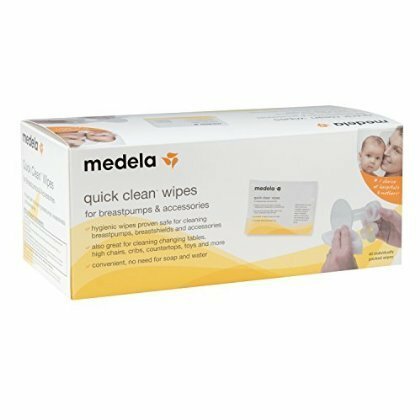 Quick Clean Breast pump and Accessory Wipes provide a convenient portable cleaning solution-no need for soap and water cleaning after each pump session. These hygienic wipes are proven safe for cleaning breast pumps and accessories, as well as high chairs, tables, cribs, and countertops.